The cuisine of Roses is characterized by the variety of typically Mediterranean products. 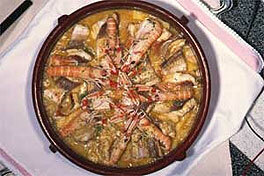 It is a traditionally made cuisine with selected produce, since it is based on fresh fish from the Bay of Roses. The rich heritage of Roses can also be savoured at the table. The local gastronomy is as dynamic as the town and it has undergone a series of changes and evolutions. The local fishermen’s maritime traditional art created a recipe based on a combination of fresh produce. Fish stew, a simple dish which consists of freshly-caught fish boiled with potatoes, was cooked both at the coves and in the homes. Over time, this homemade recipe has been enriched by incorporating typical Mediterranean products and thus new versions have developed. 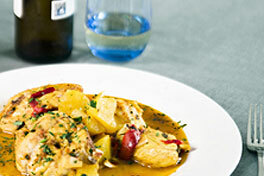 The restaurants taking part in the “Fish Stew of Roses” campaign present different recipes of this traditional fishermen’s dish, while offering a wide range of wines with DO Empordà. This symbiosis of land and sea contributes to increasing the value of the Costa Brava, a gorgeous place.